Firstly I'd like to thank you for the plugin, I've looking for something like this and I am glad you managed to do it! I've been testing it on my LM, it works amazingly well (although the cooldowns get a bit messy at some points, you are aware of it so it's ok). I'd like to suggest that you add Signs of Power Command and See All Ends skills. Thanks Haihe and to everyone who's given feedback on the plugin. Lots of support and positivity, and I'm really happy with this. Grimm: It's in my backlog, so +1. I saw a need for this from near the start of this, and I skipped it as not critical to getting a version out for people to look at. Grimm: Also +1. Same as above. Grimm: Ooh, new idea, and I like it. I didn't add any CLI commands (again, get something out sooner than later). I started with a static config panel, and I think adding CLI command would be very valuable to easily interact with this plugin. Hi, works for every character but for LM (the irony haha). First it worked but i had my Client in german so the debuffs were not on track obviously. After i changed my Client to english the Plugin would not load for my Loremaster. But every other Class works. [09/21 03:21:02 PM] ...nline\Plugins\Grimmerthan\DebuffVitals\Utilitie s.lua:8: Unable to parse file! That's interesting, Aethrilia, and I would expect issues like this until I work on localization support. Saved plugin data is not cross-language at all. If you're interested in using the plugin on English (for now), please delete the plugin data file (troubleshooting tips above). FWIW, you are correct, that's due to saving decimal values (in FR/DE client decimals save as "," and in EN they save as "."). Vindar created a patch for the save and load routines but it doesn't automatically force numbers to the current client format when reloading, an improved version which also handles automatically coercing numbers to the current client format can be found in my Anthology plugin (copy the vindar.lua file to your project and call the wrapper functions instead of the built-in functions). You just have to watch out for complex objects like colors where you will still have to coerce the individual values (Anthology also includes samples of how to do that using my euroNormalize function - see main.lua for the function definition and usage). When properly implemented, users can load plugin data regardless of which version of the client they were saved with (the way we all wish it worked using the built-in functions). Thanks Garan for explaining more fully. I've been re-reading posts on locale and skimming through code, to see what code I can steal, I mean lift, I mean borrow, I mean leverage. I'll head directly to your Anthology plugin. Currently this plugin will not adjust its display of health, power, or effects unless you are selected on that mob. So in order to check for mobs that are broken from a daze or have one of the lore skills refreshed, you have to cycle though each mob. That said. Thank you very much for your work on this plugin, it is extremely useful. Several Beorning abilities that offer debuffs are missing: Bee Swarm, Armour Crush, Grisly Cry and Piercing Roar. On what basis did you include Warden and Hunter bleeds, but not Guardian/Burg/Beorning bleeds? The list itself should be sorted by common debuffing states, actual debuffs from abilities and damaging effects to make it more legible. Does a fear effect like Grisly Cry fall under common - rooted? 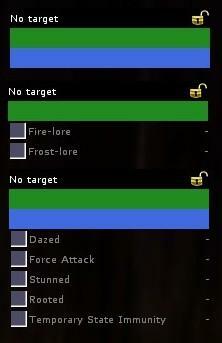 The frame itself has no option to disable the target bar: it should offer such an option so it can be used like Buffbars/Buffmonitor, but in this case to track debuffs/dots on your current target/targets. 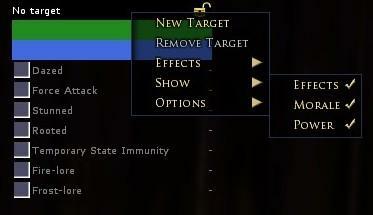 The effect list offers no possibility to customise the order in which the effects are shown: right now it would be impossible to show Warden bleeds + LDots at the top and debuffing effects below that. The frame gets spammed really quickly once you display Warden LDots: there should be an option to either hide the default description to just have the icon of the effect + the timer, or the option to customise the displayed name of a predetermined effect. Last edited by Myrthian : 09-30-2018 at 05:18 AM. at all Chars where I log in. In the current version. Hi bornfight, your system doesn't have "Turbine Classes and Examples" installed, which is a dependency. If you use Plugin Compendium to install the plugin, the dependency is handled automatically. Please look at step 4) in "Installation Instructions" in plugin info above, to do this manually. Last edited by Grimmerthan : 09-30-2018 at 10:55 AM. Yes, grawpy, this is limitation of the client. The Lua interface is limited to what the client knows. In this case, your client gets direct information from the target (also when in fellowship or raid, some information is shared between players). The outcome is that morale and power cannot be actively updated unless the mob is targeted by you. Effect timers have their own individual timers, and will continue to expire (although I do need to reconsider how I handle toggle effects). Hi Myrthian, oh boy, lots of points Yay! 1) The basis is prioritization of what seems valuable, as influenced by my experiences and by what my beta testers asked for. My operational priority has generally been debuffing effects, common effects, and damage effects. More effects will be added, and this will go more quickly, if information about the effect were made available for me (the class that can generate it, the case-sensitive name of the effect as seen on the mob, and whether it has a timer or not). 2) List order is subjective. As noted in "Upcoming and future work" above, I will add the possibility to re-order effects as desired. 3) I don't know. What effect does "Grisly Cry" generate on the mob? Please note, this doesn't look at class skills from the player; this looks at effects on the mob. 4) Hmm, interesting. I'm not sure I feel about that, as the title bar is the connection point for menus as well as target level and name. When I put in a corruption counter for bosses, the counter may end up there too. Let me think about that. I've noted it down explicitly. 6) An option for hiding inactive effects has been thought about, and it was lower priority to getting current functionality released. I've noted it down explicitly. someone made a hit for x amount of damage with Heartseeker on "targetname". 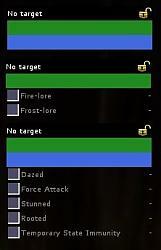 The Warden Dots are fairly easy to track, as they have a initial damage, with a unique name.